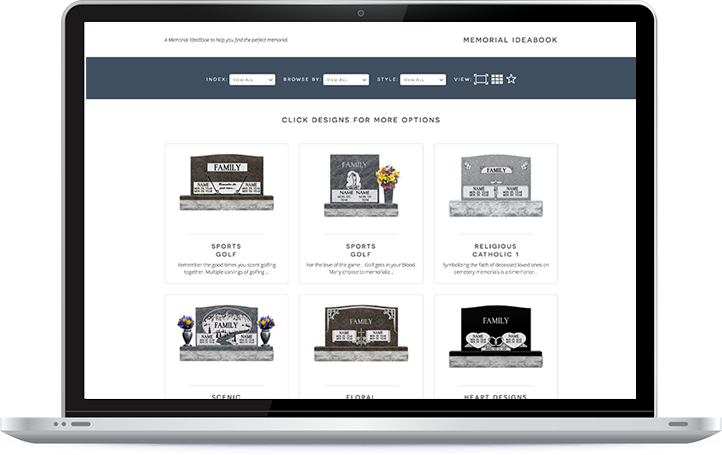 Patten Monument Company- Michigan & Indiana's leading provider of Headstones, Cemetery Monuments, Grave Markers"
The last best thing you can do for a loved one. 5 things to know before you choose a monument. Having crafted monuments and memorials for generations, we hear story after story of individuals and families feeling overwhelmed when purchasing a monument for the first time. It shouldn’t feel that way. So, in conjunction with our tireless efforts of making every memorial experience as pleasant as possible, we’ve gone ahead and simplified the monument process into five easy steps. A life well-lived deserves a memorial well-crafted. While the age-old adage, “a picture is worth a thousand words,” has been used many times over the years, when it comes to selecting a monument, its truth still holds some weight. You don’t have to take our word for it, though. See for yourself with our gallery of images and monument examples. How you’ll be remembered is now entirely up to you. Perhaps you have a clear vision for your monument but are struggling to put it into words or find relevant examples. With our interactive, easy-to-use “Design Your Own Monument” tool, you can now explore countless possibilities and bring your vision to life. My family and I are so grateful to you for your wonderful gift of the beautiful granite memorial benches for President Ford’s grave site. We so appreciate the personal attention and assistance you provided in planning and placing the benches just in time for President Ford’s 94th birthday ceremonies in July. The meditation area blends in seamlessly with the burial site and will allow visitors a beautiful setting to sit and contemplate President Ford and his many accomplishments. Thank you for your generosity from the bottom of my heart. Mark’s stone is a remarkable tribute and has received numerous compliments — even from strangers and staff at the cemetery. We couldn’t be more pleased! On behalf of my family & friends, I would like to thank you for providing such a beautiful headstone for my husband. Realizing the additional pressure placed on all of you; with a deadline and the pictures, signatures, etc. makes your skilled technique even more impressive. Mark’s stone is a remarkable tribute and has received numerous compliments – even from strangers and staff at the cemetery. We couldn’t be more pleased! Thank You So Very much for everything. I have been remiss in sending this card and thanks to you. Last New Year, you worked very patiently and kindly with me in getting my father’s headstone to Northern Michigan in time for our family gathering. I cannot tell you how much I, and my family, appreciated your efforts. I’m so glad I came into your business. Dave DeBoer gave me wonderful ideas that my kids could handwrite a special message to their dad on the headstone. You were so kind to me and my kids and made my experience wonderful. The headstone is perfect!! I drove to the cemetery last week to see if the headstone was there. What a beautiful surprise!!! Dave you were so kind, wonderful and helpful. I just want you to know the family got tears in their eyes when they saw this layout. Not only because of their loss but because it turned out so beautiful! Thank you to who ever put in the extra effort into this design. I didn’t tell them for sure but I was hoping you could make a couple of copies of this layout when completed for the family to keep. Is that possible? Maybe I will frame it for them as my gift to the family. I just thought you and your staff should know they are appreciated. Patten Monument Staff, Thank you for the beautiful stone for my husband Frank. The Grand Haven light house is very special. Nice Job. With my thanks. We would like to thank you for the wonderful head stone for our son. It looks good at his elementary school… Thanks for helping us through this difficult time. Dear Dorothy (sic), Joe & Staff, On behalf of my family & friends, I would like to thank you for providing such a beautiful headstone for my husband. Realizing the additional pressure placed on all of you; with a deadline and the pictures, signatures, etc….requested by me makes your skilled technique even more impressive! Mark’s stone is a remarkable tribute and has received numerous compliments; even from strangers and staff at the cemetery. We couldn’t be more pleased! Thank You So Very much for everything. Dear Staff of Patten Monument Co. – I am very pleased with the headstone you manufactured for my husband. It will be a great memorial for our family & friends for years to come. Dear Rob, I just wanted to say Thank You so very much to you & those that helped create our mom’s headstone. It is so beautiful. I was so surprised to see it there for Mother’s Day. I got right on the cell phone & called my brothers. They all said her headstone was awesome & were so grateful it was there on Mother’s Day. Dear Andy – Thank you so much for all the hard work that you & your staff did to make my Dad’s marker so awesome! It is a really beautiful stone – we all love it! Your staff is so patient and kind when working with a family – and so talented, too. Thank you for the extra etching of the USMC emblem and of Mt. Suribacki – AWESOME!! My dad would be proud of it. Thank you & God bless you always. To Whom It May Concern: …Buying a headstone for our son was very difficult… he loved to go up to the family cabin hunting with his dad….We drove through cemeteries looking for ideas and through a book with pictures. We found this one picture and we knew it was the right one. It had a stream, 3 deer and a turkey in the woods. It reminded us so much of up north. We asked if your company would be able to add a picture of our cabin, remove the stream, and add more ferns and branches. When he showed us the proof with the changes we had asked about and our son’s picture centered at the top of the headstone above the color picture, we cried. We were very satisfied with the proof and said to go ahead and order it. The headstone arrived the day after Father’s Day and we have had so many compliments on it. Thank you from the bottom of our hearts for giving us a beautiful memorial and a wonderful tribute to our son. Patten Monument Co. Just a note to tell you my family and I are very pleased with your workmanship in creating the appropriate memorial marker for the gravesite of our husband, father & grandfather. We are so pleased to have your expertise in the placement of the symbols we chose. We also appreciated the advice and patience Ed gave us as we were given time to decide on what we desired. Thank you so much. Patten Monument Co. Thanks so much for your help. I’m very pleased with your thoughtful service. It has been a pleasure for me although at the same time dealing with a void in my life. God’s will for all our lives is the very best. May God Bless your Company as you serve Him.